We’d love your help. Let us know what’s wrong with this preview of The Anti-Politics Machine by James Ferguson. To ask other readers questions about The Anti-Politics Machine, please sign up. Ferguson describes this book as “not principally a book about the Basotho people, or even about Lesotho; it is principally a book about the operation of the “international development” apparatus in a particular setting.” His book is about the complex relation between the intentionality of planning in a development project in Lesotho and the strategic intelligibility of its outcomes, which turn out to be unintended, but instrumental in expanding state power and, at the same time, depoliticizing t Ferguson describes this book as “not principally a book about the Basotho people, or even about Lesotho; it is principally a book about the operation of the “international development” apparatus in a particular setting.” His book is about the complex relation between the intentionality of planning in a development project in Lesotho and the strategic intelligibility of its outcomes, which turn out to be unintended, but instrumental in expanding state power and, at the same time, depoliticizing the power. Against the backdrop of the swarm of development agencies in Lesotho, Africa, he employs a Foucauldian notion of discourse being a practice (to engage in a discourse is to do something). In a fascinating analysis, he shows how World Bank’s country report on Lesotho summarily labels Lesotho as a subsistence-based economy with high population growth untouched by capitalism. Ferguson argues that Lesotho was, in fact, affected by capitalism as early at 1910, that the World Bank is not just wrong, but systematically wrong in its portrayal of Lesotho. He describes the case of the World-bank funded Thaba-Tseka project (1975-84), which was originally designed to convert mountainous regions into commercial livestock ranges by providing road connections and low-cost production techniques. He then details why the project failed to live up to its original goals. To do so, Ferguson traverses back and forth between discourse analysis of development and ethnographic field work in his method. Such a lens provides an understanding of the reconfigurations, causalities, and particularities of each other. Furthermore, it helps me understand the processes, practices and phenomena as occurring within a larger context of discourse production, rather than appearing to act in isolation. He could have provided a less personal epilogue, though, which is rather disappointing in highly impressive book. Case study of 70-80's livestock improvement scheme in Lesotho. The big anthropology critiques of development are well trodden and contestable. The beauty of this book is (1) how well it nails the details (the nuances of failed livestock, decentralization, and integrated rural development schemes), (2) how clear and accessible it is, (3) how seamlessly it relates theoretical arguments to concrete project developments. 1 - The principal effect of development projects is the (depolit Case study of 70-80's livestock improvement scheme in Lesotho. 3 - The big danger of development projects is less that they act on developing countries as subjects on objects and more that they fail to recognize that development projects themselves are objects being acted on by political machinery at both national and international levels. Excellent book on the problems with development projects, especially why they always seem to fail when they, assumingly, set out to do good. Especially potent for anyone thinking about working with the World Bank or the Peace Corps: the book does not necessarily condemn these development organizations totally: in fact Ferguson points out that the people on the ground, the volunteers, etc., are actually in many ways trying to make a difference. Yet, the structure and mechanisms of the projects an Excellent book on the problems with development projects, especially why they always seem to fail when they, assumingly, set out to do good. Especially potent for anyone thinking about working with the World Bank or the Peace Corps: the book does not necessarily condemn these development organizations totally: in fact Ferguson points out that the people on the ground, the volunteers, etc., are actually in many ways trying to make a difference. Yet, the structure and mechanisms of the projects and the multi-national organizations create a situation where what is intended to get done is not always what actually is accomplished...and the intended effects are not what's important, but the "instrument effects", following Foucault. Probably one of the most important and refreshing books on development. Published more than 20 years ago, but still amazingly relevant. Through the extreme case of Lesotho, James Ferguson gives a powerful analysis of how development aid is disconnected from local realities, how it is instrumentalized by politics, and why a technical "neutral" approach is used to justify political agendas that do not improve living conditions for the poor. Even though the author is just an observer, unwilling to ad Probably one of the most important and refreshing books on development. Published more than 20 years ago, but still amazingly relevant. I specially enjoyed the depiction of social value of cattles that opposed capitalistic notions in Bovine Mystique --how to some extent the cultural construct ranging from ages, gender, and patron/client relations have created some sense of 'securities' in a way that are indigestible by capitalistic values. It may have sounded Marxist in sometimes. What's great that his book has shed some lights on the apparent, yet self-perpetuating blind spot of development projects. A way to let yourself out o I specially enjoyed the depiction of social value of cattles that opposed capitalistic notions in Bovine Mystique --how to some extent the cultural construct ranging from ages, gender, and patron/client relations have created some sense of 'securities' in a way that are indigestible by capitalistic values. It may have sounded Marxist in sometimes. This was a mind-bending trip into the world of international development and just how bizarre, counterintuitive, and flat out insane the industry can be. I have always been a proponent of local solutions and this provides clear evidence in favor of that. I found the conclusion and epilogue a bit underwhelming and repetitive, but this didn't take away from Ferguson's firsthand experiences and the book as a whole. This was an intelligent and thought-provoking book. It is a terrific deconstruction of the institution of "development." The subject of the book is a development project in Lesotho. It discusses how the Canadian International Development Agency (Canada's USAID) twisted a complex situation into a simple model so that it could apply its standard "development" prescriptions to the situation at hand. The resulting project was a failure and the book examines exactly why it was such a failure. Adapted This was an intelligent and thought-provoking book. It is a terrific deconstruction of the institution of "development." Adapted from the author's PHD dissertation, the book is a bit dry and plodding at times, but it is lucid and full of terrific analysis. "Often, the question was put to me in the form "What should they do? ", with the "they" being not very helpfully specified as "Lesotho" or "the Basotho". The "they" here is an imaginary, collective subject, linked to utopian prescriptions for advancing the collective interests of "the Basotho." Such a "they" clearly needs to be broken up. The inhabitants of Lesotho do not all share the same interests or the same circumstances, and they do not act as a single unit. There exists neither a collective will nor a collective subject capable of serving it. "When "developers" spoke of such a collectivity, what they meant was usually the government. But the government of Lesotho is of course not identical with the people who live in Lesotho, nor is it in any of the established senses "representative" of that collectivity. As in most countries, the government is a relatively small clique with narrow interests... Speaking very broadly, the interests represented by governmental elites in a country like Lesotho are not congruent with those of the government and in a great many cases are positively antagonistic. Under these circumstances, there is little point in asking what such entrenched and often extractive elites should do in order to empower the poor. Their own structural positions makes it clear that they would be the last ones to undertake such a project." "If the question "what should they do" is not intelligibly posed of the government, another move is to ask if the "they" to be address should not be instead "the people." Surely "the masses" themselves have an interest in overcoming poverty, hunger and other symptoms of powerlessness... Once again, the question is befuddled by a false unity. "The people' are not an undifferentiated mass. Rich and poor, women and men, city dwellers and villagers, workers and dependents, old and young; all confront different problems and devise different strategies for dealing with them. There is not one question -- "what is to be done" -- but hundreds: what should the mineworkers do, what should the abandoned old women do, what should the unemployed do, and on and on. It seems, at the least, presumptuous to offer prescriptions here. The toiling minters and the abandoned old women know the proper tactics to their situations far better than any expert does. Indeed, the only general answer to the question, "What should they do?" is: "They are doing it!."" "If one takes the "development" problematic at its word... the absence of growth in agricultural output... can only be considered an unfortunate mistake. But another explanation is possible. if one considers the expansion and entrenchment of state power to be the principal effect -- indeed, what "development" projects in Lesotho are chiefly about -- then the promise of agricultural transformation appears simply as a point of entry for an intervention of a very different character. 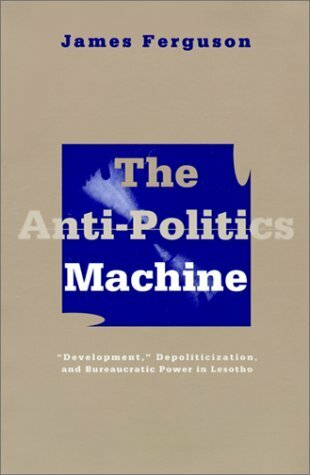 In this perspective, the "development apparatus in Lesotho is not a machine for eliminating poverty that is incidentally involved in bureaucracy; it is a machine for reinforcing and expanding the exercise of bureaucratic state power, which incidentally takes "poverty" as its point of entry." An absolute classic in the literature of development. Ferguson's work examines the institutions, policies and practices of the development industry as a set of discourses with real-world effects on the ground. His work draws largely on Foucauldian insights on the power relations within discourses that claim to de-politicize socially and historically-rooted inequalities among the people of Lesotho. Although the book could have used more ethnographic information in the first chapters, by the time An absolute classic in the literature of development. Ferguson's work examines the institutions, policies and practices of the development industry as a set of discourses with real-world effects on the ground. His work draws largely on Foucauldian insights on the power relations within discourses that claim to de-politicize socially and historically-rooted inequalities among the people of Lesotho. Although the book could have used more ethnographic information in the first chapters, by the time Ferguson delves into the failed methods practiced and reinforced by the World Bank, the book takes a vibrant and refreshing new course. This book is a must-read for anyone remotely interested in the development industry. Even though Ferguson focuses on Lesotho, he exposes the development apparatus as it functions globally, using Foucault's analysis of the evolution and discourse of the modern prison system as a model for his analysis of development discourse and its effects. If you can't read the whole book, at least read the first chapter. This book is an engaging, thoughtful critique of development policy, particularly the kind of institutionalized, top-down programs organized by the World Bank in the late 1970s/early 1980s. And although it uses the case of Lesotho to make it's point, the research is helpful to anyone seeking to better understand the conceptual and practical flaws in this kind of approach to "developing" a nation. One of the best concrete examples about the disjuncture between intentions and results in the development world, and a great example of what anthropology should be. Everyone interested in in doing development right should read this. brilliant, on-the-ground description, of a 'development' program in action - reinforcing the idea that development outsiders (so-called experts) will always be limited by their lack of local knowledge. I didn't like his writing style; this book read like a PhD dissertation. But I think what Ferguson's saying is important. Sadly, I feel like most people working in development still aren't listening. This book is so brilliant, yet frustratingly written. I completely agree with his argument and the research is flawless. However, the process of reading this book can be a bit slow moving. Highly recommended for those who like Foucault and are interested in international development. the chapter where he takes apart the World Bank report is so funny. It should be titled, " Are you morons kidding me?!!!?" Also the part where he talks with Basotho men about cattle is great too. i love this book. so smart, so well written. also, i love pony trekking in lesotho. Who knew a book on problematics and apparatuses could be boring? Brilliant and lucid. The cornerstone of post-development critique and a wonderful narrative to accompany salient discourse. Librarian Note: There is more than one author in the Goodreads database with this name. This is James^^^Ferguson. James Ferguson is Susan S. and William H. Hindle Professor in the Department of Anthropology at Stanford University. He is the author of Global Shadows: Africa in the Neoliberal World Order and the coeditor of Culture, Power, Place: Explorations in Critical Anthropology, both also publi Librarian Note: There is more than one author in the Goodreads database with this name. This is James^^^Ferguson.